Hi everyone, it’s Sara from Bitz & Giggles! Is everyone staying warm? In the Midwest we’re struggling through a deep freeze, and I know many other parts of the country are feeling it as well. 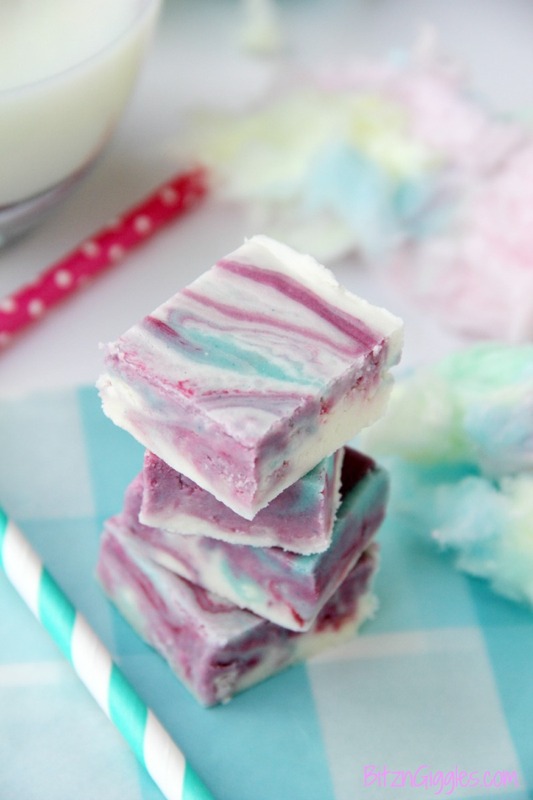 All this cold and snow can make a person feel as dreary as the sky looks outside their window, HOWEVER, today I’m bringing some color and sweetness to you with this delicious Cotton Candy Fudge! I was surfing through channels the other night on the television and I happened to find a show that was highlighting carnival foods – you know, all of the stuff we’re really not supposed to eat, but crave 24/7? The sweet, the fried, the treats on a stick? Yep, you know what I’m talking about. Of course I watched the whole thing and then fell asleep dreaming of cotton candy. The smell, the taste, the color. I love cotton candy so much, I actually have a Cotton Candy Lemonade recipe that the kids beg me to make in the summer. 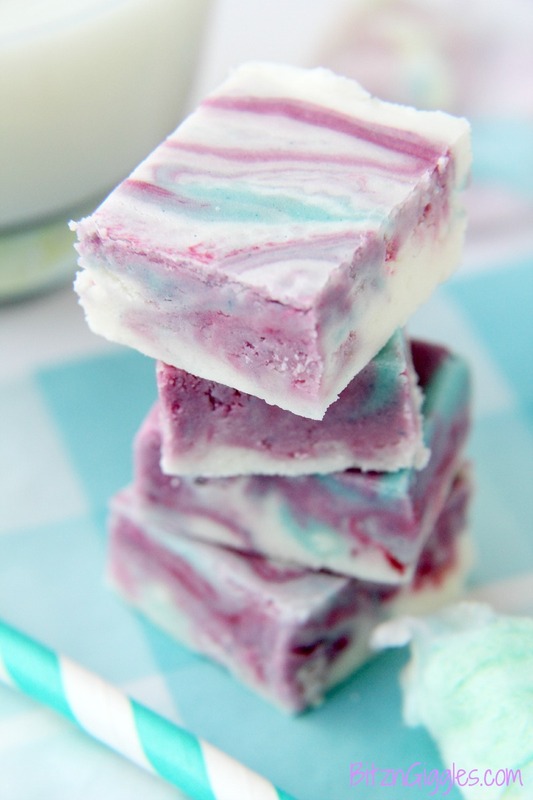 Inspired by the show and in hopes of warmer weather soon, I thought it would be fun to share a fudge recipe with a sweet and colorful, carnival twist. Kids love this fudge, adults love this fudge – it’s an excellent dessert to serve at birthday parties and showers and even perfect for Valentine’s Day and Easter! The recipe makes an entire 13 x 9 inch pan of swirled sweetness. Double the recipe and you’ll be able to fill a good size platter with these little squares. And that’s all you really need – one or two of these little squares to get your dessert “fix.” Oh, alright. Maybe three or four. . .well, who’s counting really? Bottom line is, one pan of this fudge goes a LONGG way. Can you even keep up with all of this foolishness? 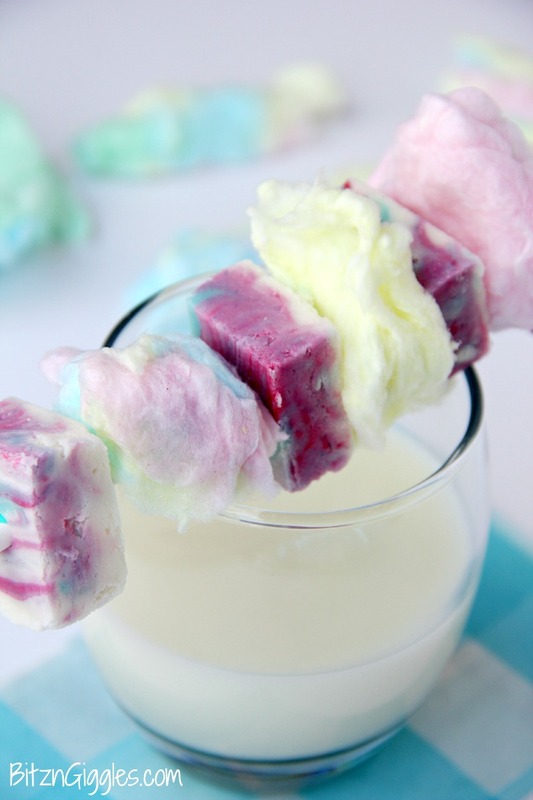 Fudge and cotton candy skewers. Wait until my mom reads this one. She’s going to think I’ve lost my mind. How much worse is this than fried butter on a stick they sell at the Iowa State Fair? We’re trying to forget it’s cold outside, right? Right. See that glass of milk in the background? You’re going to need that. Pour 3/4 of the mixture into the foil-lined pan. Add the cotton candy flavor mix to the saucepan and stir until well mixed. Drop or drizzle spoonfuls of the cotton candy mixture over the mixture already in the pan. Add 2-3 drops of the pink food coloring in various areas on top of the fudge in the pan, and then cut through the fudge with a butter knife to make the swirls. Cover and allow to set in the refrigerator. Remove the fudge from the pan by picking up with the foil and then cutting into squares. 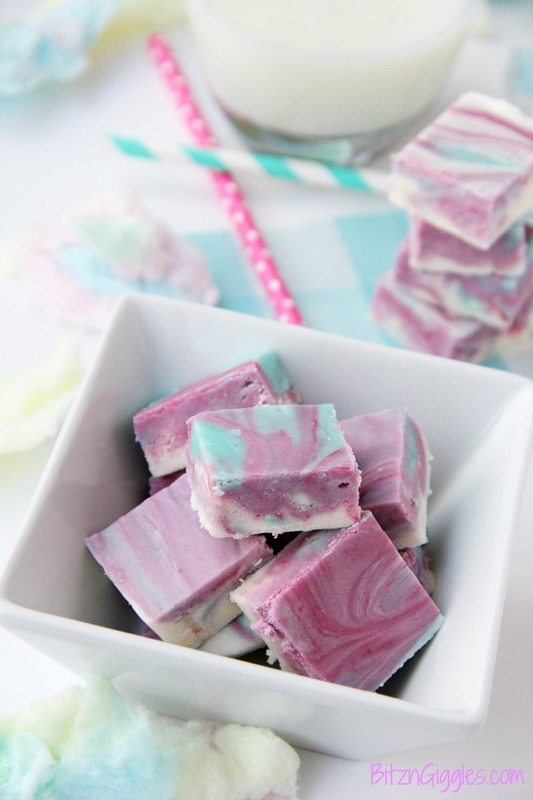 So, there you go. . .Cotton Candy Fudge. Sharing this with you all has made me feel so much better. Now I’m excited about summer, I’ve gotten my cotton candy fix and I can’t wait to make another pan of this delicious fudge. It’s happening for Valentine’s Day for sure. A sweet treat for those I love the most!